The illustrated Lansky Knife Sharpener is the Lansky Tri-Stone Benchstone Knife Sharpener that features rotating 2" by 6" diamond, alumina oxide and ceramic stones for versatile sharpening. Use the diamond stone for fast edge resets, use the alumina oxide surface for touchups and use the ceramic stone for a finished edge. A sturdy plastic bench mountable base with non slip rubber feet is included with this Lansky Knife Sharpener. 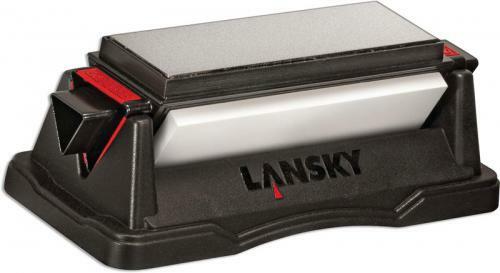 The Lansky Tri-Stone Benchstone Knife Sharpener is made in the USA.